The Church of Saint Thomas of Villanova, commonly known as the Miagao Church, is the Roman Catholic parish church of the town of Miagao in Iloilo Province. Completed in 1797, the church is famous for the artistic sculptural relief carved on its facade. 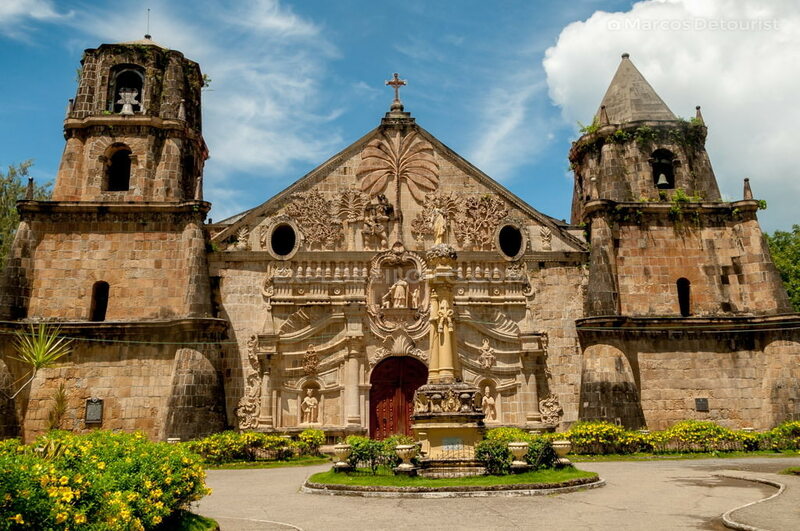 In 1993, the church was designated as one best examples of the Baroque Churches of the Philippines and included in the list of World Heritage Sites by UNESCO. The Miagao Church stands as a living legacy of the culture and way of life of the people of Miagao centuries ago, anchored in a strong foundation of Christian faith. As most travelers would agree, the Miagao Church is one of the country’s architectural gems because of its unique and imposing designs, ornaments and motifs. The Miagao Church is 30 to 45 minutes away from Iloilo City. Commuters can take a “Miagao” or any south-bound jeepney from Mohon Terminal in Molo District or from the Iloilo Terminal Market in Iloilo City Proper. For more information about how to get to Miagao, visit our Iloilo Transportation Guide. The artistic facade of the Miagao Church is decorated with a relief sculpture of St. Christopher carrying the Christ child amidst coconut, papaya and guava shrubs. Like any other foreign influences, the architecture of many colonial churches has undergone the process of indigenization. This process is carried out by incorporating the prevailing Hispano-American and Medieval Spanish architecture with local as well as Muslim and Chinese touches. Thus, the synthesized topology which is anachronistic with the unmindful sues of decorative elements. It had no distinction in terms of periods or orders. A truly ‘Philippine Church’, it exudes a native touch. A large stone image of St. Thomas of Villanueva, parish patron saint, dominates the center. Carved life-size statues of the Pope and St. Henry with their coat-of-arms above them flank the main entrance. Supporting the facade are the twin belfries, one towering two-storeys and the other three-storeys high. The church’s simple interior is nevertheless highlighted by a striking gold-plated retablo. In Baroque-Romanesque style, the church sinks six (6) meters deep into the ground with walls one-and-a-half (1 1/2) meters thick and buttresses thrice thicker. The creative and aesthetic abilities of Spanish colonizers are reflected in many colonial churches in the Philippines. This is especially true in Miagao Church – a world-renowned religious structure now included in the UNESCO World Heritage List. Discover more blogs and travel tips in Miagao. hi! thanks for this beautiful post! what is the best means of transportation if I will be visiting this church from Iloilo City? i’m planning to be in Iloilo this Sept on a solo backpacking tour and i will be staying in the city. i’d love to visit this church, together with the San Joaquin, Guimbal, and Tigbauan churches. which means of transportation would you advise? and also, is it possible to visit all of these churches in one whole morning? or will I need more time to cover all four? thanks! will appreciate any help. maganda sya kaso wla akong masyadong maintindihan…………………. I hope you don’t mind if I post your link to our wedding website. Thank you for a very informative website. maganda ang mga larawan mo pero sana, pinasyal mo pa ang buong church para saamin. sa pamamagitan ng mga larawan . salamat saeffort mo well appreciated.